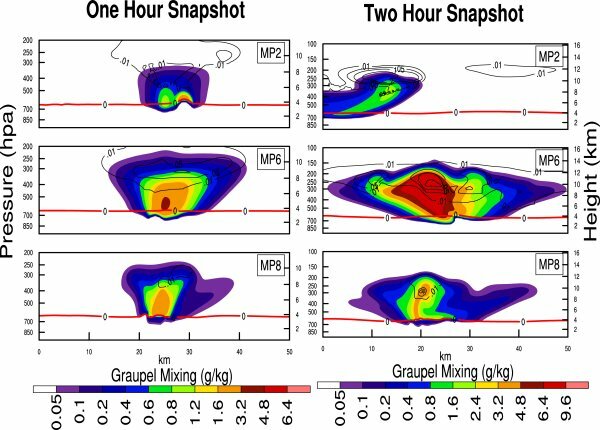 Results: Computer simulations of thunderstorms using data from a field campaign in Australia confirm that the "ice-phase" cloud processes in climate models contribute most to the wide discrepancy between model results and actual cloud measurements. This was a key finding from PNNL scientist Dr. Yi Wang and his colleagues from a recent study. The study revealed the most effective tool for detecting when current schemes within climate models do not work well enough: evaluating the simplified representations of these clouds in climate models using actual measurements from field campaigns. Why it matters: This finding highlights the importance of representing ice clouds properly in models, which is important to the success of the next generation of climate models and their ability to predict future climate. As high performance computing resources and technology advance, the next generation of climate models will run at much finer spatial resolutions (less than 10 km). This finer resolution permits the representation of cloud-sized phenomenon such as thunderstorms. At such high resolutions, the information gained from traditional larger-scale climate model resolutions may be invalid. These next- generation climate models will rely heavily on newer, more sophisticated means of representing clouds. The tropics are the so called "heat engine" of the atmosphere. The clouds in the tropics have a large impact on climate, global water and energy cycles, and weather patterns by affecting the amount of solar energy that reaches the Earth's surface. A better understanding of tropical clouds and their interactions with the environment will help scientists develop better climate models. Methods: The team used data collected from the 2006 Tropical Warm Pool-International Cloud Experiment (TWP-ICE)—a U.S. Department of Energy (DOE) Atmospheric Radiation Measurement (ARM) Program-sponsored field campaign, which took place at the ARM Climate Research Facility site in Darwin, Australia. The team conducted a suite of evaluations for three different ice-cloud-producing schemes in one of the more sophisticated of current models: the Weather Research and Forecasting model. The evaluations consisted of comparing the TWP-ICE data to corresponding model results for each of the three different ways that the model produces ice clouds. To ensure that only the different ways that ice clouds are represented and interact with other predicted physical quantities in the models, all other possible influences and processes were treated the same during the model runs for this study. 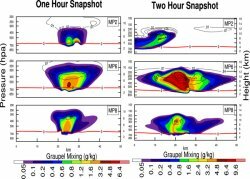 The team's evaluations using a simulated thunderstorm especially illustrated the wide discrepancy of the ice-phase-cloud microphysics in tropical clouds. What's next: The team is working to improve the model simulation of high-layer cirrus clouds during the monsoon periods of TWP-ICE when there were clouds but not widespread rainfall. The results will be compared with TWP-ICE and satellite observations from NASA. Acknowledgments: In addition to Dr. Wang, the research team included Drs. Charles Long, L. Ruby Leung, Sally McFarlane, James Mather, and Steve Ghan, PNNL; Jimy Dudhia, National Center for Atmospheric Research; and Xiaodong Liu, Institute of Earth Environment, Chinese Academy of Sciences. The research was supported by DOE's Biological and Environmental Sciences as part of the ARM Program. A portion of the model simulations was carried out at the Environmental Molecular Sciences Laboratory, a DOE national user facility at PNNL. Reference: Wang, Y., C.N. Long, L.R. Leung, J. Dudhia, S.A. McFarlane, J.H. Mather, S.J. Ghan, and X. Liu. 2009. "Evaluating Regional Cloud-Permitting Simulations of the WRF Model for the Tropical Warm Pool International Cloud Experiment (TWP-ICE), Darwin, 2006." J. Geophys. Res., 114, D21203, doi: 10.1029/2009JD012729.